The fundamentals of bisque firing include whether to fire to a soft or hard bisque, the stages of firing and their typical schedules, and the effects of a first firing on subsequent glazing and refiring. Firing ceramic forms proceeds in stages. First moisture evaporates from the clay. Next, organic matter in the body burns away. Then chemically bound water is driven off. Finally, sulfur compounds burn off, carbonates decompose, and the work sinters and shrinks. Regardless of the intended peak temperature of a first firing, the start of the process is the same. The kiln atmosphere must always be rich in oxygen. In an electric kiln, that’s a given. In a fuel-fired kiln, excess air is a requirement. Without it, organic and sulfur compounds won’t burn off and can then cause faults in a later glaze firing. Bisque or Biscuit Firing: The first firing of ceramic ware to make it strong enough to handle conveniently. Candling: Gently heating a kiln and its contents above room temperature but below the boiling temperature of water. Chemically-Bound Water: Hydroxyl (–OH) ions of oxygen and hydrogen, which are part of the crystal lattice of clay minerals. Densification: Reduction of the volume of a ceramic piece by heating it until its constituent materials melt or recrystallize and fit into less space. ceramic ware one time to produce the finished work. Twice Firing: The process of firing ceramic ware, then glazing it and firing it again to obtain the finished or sometimes intermediate product. In the first firing stage a kiln is heated from room temperature to just short of the boiling temperature of water at that location. In this stage, any free water that has not already evaporated from the work is driven off. This stage is called candling, a term which implies that the ware is being heated at a pace as slow as if the heat source were just a candle. Candling is a safe way to make certain the ware is dry and the free water is driven off. How does one tell when candling is complete? In an electric kiln make sure the vent fan is off, then hold a room-temperature mirror up to a vent hole in the kiln. If the surface of the mirror fogs, water vapor is still coming off the ware. However, there is no such simple technique for a fuel-fired kiln. That’s because it has a chimney draft and air flows in, not out, at the vent. Once the work is heated to the boiling point of water, all free moisture should have been driven off, if not, it will turn to steam. If there is enough free water left in the clay, at this point the steam can expand rapidly and burst the ware. Don’t ask how I know this. Simply remember that vacuuming tiny shards of an exploded piece of greenware from the elements of an electric kiln is tedious. It does, however, give one time to ponder the error of one’s ways. Organic matter in the clay body begins to burn off at about 450°F (232°C). While this typically doesn’t reduce the weight of the work greatly, it does produce the same smoke as that made by burning wood or paper. Kiln ventilation above 450°F is important to keep those fumes out of the air in the kiln room. Next, chemically bound water within the lattice of the clay minerals making up the work is driven off. This step is called dehydroxylation. Strictly speaking this water exists inside the crystal lattice as –OH ions. Dehydroxylation occurs between 842° and 1022°F (450°–550°C) and reduces the weight of kaolinite, the most common clay mineral, by about 13.2%. Sulfur compounds burn out above 1112°F (600°C). Most of the sulfur is iron sulfide, the mineral pyrite, which is found in many ball clays. Burning sulfur compounds produces a small amount of sulfur trioxide, which reacts with water (even the moisture in your eyes or in your mouth, nose, and lungs) and becomes a tiny but irritating amount of sulfuric acid. That’s another reason why venting the kiln is important. If calcium and/or magnesium carbonates are present in the clay, they will decompose as the kiln temperature rises. Magnesium carbonate becomes magnesium oxide and gives off carbon dioxide gas above 622°F (350°C). Calcium carbonate does the same above 1544°F (840°C). At some point the clay body has essentially lost all the weight it will lose in the firing. However, it has just begun to become stronger and denser. 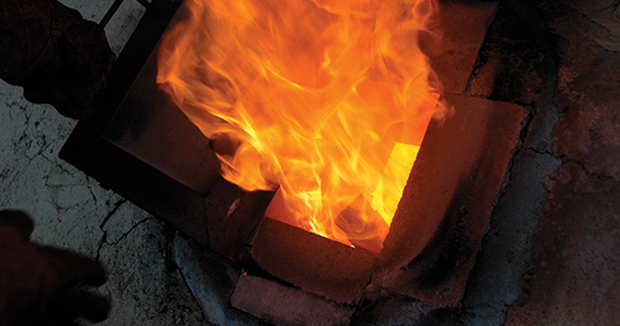 This occurs as the kiln temperature continues to rise and the edges of the clay crystals bond to each other, a process known as solid-phase sintering. Feldspar and other flux-bearing ingredients in the body will also melt to form a glass phase. That causes the clay and silica particles present to bond with the liquid glass. This process is liquid-phase sintering. Sintering makes the work stronger and more durable and causes it to shrink in size, a process called densification. How far to carry densification is a subject in itself. Cone 08 to cone 04 is a common end range for the first firing of work made from clays that will be glaze fired at cone 5 and higher. Stoneware and porcelain bodies fired to cone 012 will be relatively weak, soft, and porous. However, high-talc bodies and earthenwares may be significantly stronger and denser fired to the same temperature. The temperature that is considered best depends on the body and the density desired. Soft bisque can be carved, a technique some Chinese potters use to obtain thin pieces with limited breakage. Because soft bisque absorbs water well from a glaze slurry, it readily accepts a thick application of glaze. Dense bisque is most common in industrial settings. Glazing fully dense bisque may be challenging, often involving preheating the ware before applying a glaze with limited water content, a gum, or both, to keep the glaze in place on the ware. However, this allows use of a glaze which matures at a lower temperature and without some of the glaze flaws that can result as the body continues to densify under a partially or fully molten glaze. What’s most important to understand about bisque firing is that it’s the first step in a two-step process. The intent is to drive off moisture, carbon, and sulfur and make the work dense enough for the next step. Work of uniform thickness, simple in shape, and made from a porous body can be fired remarkably fast. However, the firing rate cannot be faster than the formulation and condition of the ware will allow. While commercial tile is typically fired “cold to cold,” that is, room temperature to cool enough to handle, in less than an hour, a kiln loaded with work that has thick and thin sections needs to be fired more slowly. For example, just heating a kiln load at 25°F per hour for 4–6 hours may be prudent for candling. Even then, if the work is exceptionally thick or was loaded before it was bone dry, even slower candling may be necessary. Even dry ware should be heated with some caution in the first firing to allow time for the pieces in the kiln to warm at nearly the same rate. Imagine thick ware heated rapidly. The outside will be hot, but the center cooler. Expansion of the outside, or thin additions, will be greater than in the cool center. If carried to an extreme, too high a firing rate will cause cracks or breaks in the work. Heating after candling at a rate of 150°F to 300°F (83° to 167°C) per hour up to about 1600°F (871°C) is a very conservative program and assures ample time for dehydroxylation and organic and sulfur burnout. Above 1600°F heating at 300°F/hour is still conservative. The quartz-inversion temperature is a topic of concern among kiln firers. However, the danger of damaging ware as the quartz changes volume at about 1063°F (573°C) is typically only a concern when cooling dense ware. Slowing both the heating and cooling rate in a kiln loaded with fully dense work may be appropriate around the quartz inversion temperature. acid, bisque firing, bone dry, clay, draft, glaze firing, iron, kaolinite, porcelain, reduce, reduction, short, sintering, stoneware.